on the pointer, reading devices are either needle-type or light-beam-type. In needle-type devices the tip of the needle moves with respect to marks on a scale. The tip may be arrow-shaped or in the form of a knife or a taut thread (see Figure 1). In the last two cases, the scales are fitted with a mirror to eliminate reading errors caused by parallax. 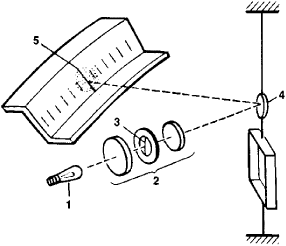 In light-beam-type reading devices a light beam reflected from a small mirror attached to the moving part of the instrument acts as the needle (see Figure 2). The position of the light spot on the scale from which the readings are made depends on the position of the moving part. A light-beam-type reading device eliminates parallax error and increases instrument sensitivity by lengthening the pointer and doubling its angle of rotation. The reading device of a digital instrument makes it possible to obtain a reading directly in digital form. Digital indicators of various designs are used to produce numerical images (see Figure 3). Mechanical indicators consist of several rollers or disks with numbers around the perimeter and a number of windows in which the digits appear (see Figure 3,a and 3,b). Electric-power meters, for example, are equipped with such reading devices. Figure 3. 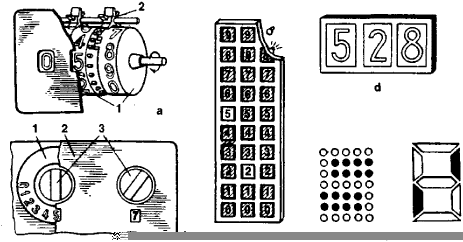 Examples of reading devices of digital instruments, (a) Mechanical device consisting of several rollers (1), which are connected through pinions (2) (mechanical rotation counter), (b) Mechanical reading device of comparison instruments (bridges, compensators) with manual adjustments: (1) dial with numbers and handle, (3) cover with windows in which numbers appear. (c) Digital reading device with dispersed digital indicators. (d) Device with concentrated indicators (all numbers in a single row). (e) Set of elements (luminous dots or segments) that form numbers. Electromechanical indicators contain moving parts with digital images, with the parts moved by electromechanical driving mechanisms. Electrical indicators use incandescent lamps, luminescent and gas-discharge elements, and cathode-ray tubes to form images of numbers (see Figure 3,c, 3,d, and 3,e). A water meter remote reading device, called ESCU, has been developed by Econets Smart Water unit. The hologram was then reconstructed and the phase information of the glass screen was used as the reference beam for a new hologram, recorded on material rigidly mounted in the reading device. If you have a PC or reading device you will need an Adobe ID to take advantage of this offer. For example, developers are using a brainwave reading device to understand dog thought process, allowing an owner to understand why a dog is barking. This will ensure that each Public Notary will have his own fingerprint reading device and it will be possible to ensure electronic verification of the identity of all visitors desirous of obtaining official records. said Thursday it began a new e-book service the same day with its dedicated reading device to be marketed on April 16. The label combines overt features such as holograms, color-shifting security inks and guilloche patterns with more covert elements including certain voiding, effects and LaserSecure - a method incorporating special pigments that only become visible via a dedicated handheld reading device. The book is divided into six parts: Part 1: Introduction; Part 2: The general reading habits of Americans; Part 3: Americans and their e-readers and tablets; Part 4: The state of e-book reading; Part 5: Where and how readers get their books; and Part 6: The differences among e-book reading device owners. 3million electronic reading devices were sold over the holiday period, while online trader Amazon declared Christmas Day the "biggest ever day" for downloads on its Kindle reading device. Aman whose dyslexia had prevented him from learning to read, believes an electronic reading device has changed his life. Blio doesn't require a dedicated reading device and users libraries are not tied to a single device. The cloud application is based on HTML5 and optimises the reading device or computer being used.